Fear or Trust — Which will win you over? My 7-year-old daughter has had one mission on her mind for months – to convince me to let her get her ears pierced. I finally agreed last week to offer my permission, but with one caveat… she had to let us pull out a stubborn baby tooth that was causing the permanent tooth to grow in horribly wrong, potentially making braces necessary if we didn’t get the baby tooth out soon. I wonder if that’s how God feels when I reject his loving assurances? How many times has He called me to take a step forward in faith and then watched in sadness as I allowed my fears to paralyze me? How many times have I, through my refusal to act on His promptings, said to Him, “I don’t trust You, God. I don’t believe what You’re telling me”? How many times have I missed out on an amazing blessing because I didn’t trust God’s path to get me there? 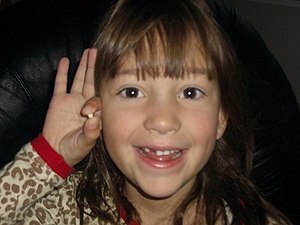 For Katelyn, at least, the reward of getting those ears pierced proved too hard to pass up. So after half a day of fretting and stressing, she bit the bullet and let Dad give the tooth a big yank. As she closed her eyes and braced herself for the certain horror that it would be, it was amusing to see her open her eyes and say, “Is it out?” She hadn’t even felt it. What is God calling you to do today? Will you push the fears aside and trust Him? How true it is Shari — and how well you put it into words……I know I’ve missed out on some good times, just because of fear…….and yet, I know he is always there…..so where is this fear or “doubt” coming from – ? ?….Even my daughter tells me “If he brought you to it, He’ll see you through it”…….so, stop all your worrying……..I don’t give her enough credit either!! !